Greetings! Even at an institution that operates around the year and around the world, there needs be a time and a place for us to gather, symbolically, to mark a new beginning. Today we assemble here in the annual ceremony of renewal and reunion that marks the beginning of another academic year and that formally welcomes into this community our newest members. I am pleased this morning to greet my colleagues from the faculty and administration, upper-class students, new and returning graduate students, and other members of the community. I am so pleased that Michael Arad could join us today and I salute Julia Hildreth as the President of the Student Assembly. But it is my particular privilege formally to extend Dartmouth's welcome to the members of the Class of 2008. While I have had the opportunity to greet each of you individually, this ceremonial occasion closes the time of transition for you and invites you to enter upon a lifetime commitment to the good work of learning. As is appropriate, we are all excited to be starting another academic year, the 235th time that Dartmouth has gathered for this purpose. Yet sharing thus a sense of our history, reminds us of our need today to mourn the death, even as we celebrate the life and contributions, of David T. McLaughlin, the 14th president of this College. Please join me in a moment of silence honoring this accomplished and dedicated son of Dartmouth. ... I am pleased this morning to announce that the Board of Trustees has agreed to name the new Maynard Street residential complex the David T. McLaughlin Cluster in his honor. We hope to break ground this fall on this important facility, on space that the College acquired for this purpose as a result of his stewardship. Members of the Class of 2008, you assembled here as individuals just a few short weeks ago. You now assume the additional privileges and responsibilities associated with being members of this community. Dartmouth is a historic and special community, one physically rooted on this plain along the Connecticut River, even as it reaches "round the girdled earth." Already you have walked along paths laid out by Eleazar Wheelock and marked by Daniel Webster, smoothed by the tens of thousands of students who preceded you. You will gather together many more times - indeed in the year 2058 for your 50th reunion! This is what institutions are about. You are now part of a long and enduring and evolving history, one that has no end. And as you fix your place in this procession you should know too that tens of thousands of future students will follow in the footprints you leave. These occasions afford me an opportunity to share my sense of this College, in observations shaped by 35 years here, teaching and learning, and also an opportunity to reflect upon the history of Dartmouth. I have in recent years talked about Dartmouth as a learning community, a place where the liberal arts provide the basis for a life well lived. I have reflected upon the importance of diversity as a critical ingredient in the educational experience. Today, I want to talk about two values that are central to our academic purpose even as they are sometimes in tension with each other: our commitment to freedom of expression and our obligation to foster here a truly inclusive community. This is an academic institution marked by a need to know, a passion to share what we know, and a curiosity about what we do not know. It depends upon shared values, a shared sense of purpose, and the assumption of shared responsibility. Our common purpose has little to do with what you have accomplished before you came here and everything to do with what you can accomplish - and what you can contribute to the accomplishments of others. You will learn from one another - and you have much to teach one another as well as the rest of us. You sit here in an arena full of classmates who can share with you this process of exploration. You will develop friendships that will sustain you for a lifetime. You need not be defensive about engaging with and forming essential friendships with those most like you. Life is full of stresses and tensions, and kindred souls - those who share with you a set of experiences, a common background, similar ambitions for life, tastes in music, literature, movies, recreational activities, common political values or religious beliefs - these are comforting and supportive friends. But education finally needs to be more than simply comforting and merely reinforcing. Reach beyond your circle of comfort. Learning is about expanding that which we know and also challenging that with which we are comfortable. College years - and, ultimately, full lives - are about testing our convictions, exploring our doubts, and engaging in debate and dialogue; these years are about challenges to certainty. Often the most fundamental dialogue is, or at least should be, with oneself. But such introspection can only follow exposure to ideas different from the ones you have brought with you. Now the opportunities for such exposure surround you. An academic community - indeed a free society - rests on the freedom to think and to speak out. The free expression of ideas is a bedrock principle, even though not all that is thought or said is equally valid or true. The corollary of the freedom of speech is the freedom to criticize that which is said. And sometimes this freedom to disagree becomes an obligation. If politeness and civility and mutual respect form the basis of our community, so too do engagement and debate and, assuredly, disagreement. Academic communities at their best are places that challenge more than they reinforce. Dartmouth needs to be a place where arguments and assumptions and conclusions are tested - and, then, tested some more. This is as it should be. Dartmouth students are incredibly generous and willing to serve, concerned about moral and ethical dilemmas, and supportive of one another. Yours is a good generation-the future is in good hands. You are also for the most part incredibly polite. This is a good thing, but politeness and tolerance need not lead to a sort of intellectual or moral relativism that discourages you from challenging ideas with which you disagree. Discuss and debate. Do not accept the uninformed or the glib or the foolish as having equal validity with sound argument and the view well crafted - with the position shaped by explicit values and principles and informed by evidence, thought, and understanding. As a historian I regret the decline in American life of true dialogue and debate on fundamental matters. Our society segments itself too readily into enclaves marked by likemindedness. Those times when we engage in debate about real differences or expose ourselves to those differences are all too rare in our society. We watch television stations, listen to talk shows, read publications, and journey to websites where what is presented serves only to reinforce what we already think, rather than to challenge our views. Attitude and ideology become more important than analysis and fact. Ideas are not things that prevail without context and contest. They need to be challenged and tested. Otherwise, they stand at best as attitude or opinion-or as prejudice. The current election campaign underlines and sadly exemplifies my concern. There is a tremendous free range of ideas in this country, unfettered by law or convention. In this respect we have met the highest hopes of the political leaders and philosophers who founded the republic. But we surely have not met their ambitions for informed debate - Thomas Jefferson talked about the "boisterous sea of liberty." The American people deserve, and indeed need, a more substantive engagement of the real issues that confront our nation and our world. Discussions and calculations about red states and blue states, about tactics and polls, about funds raised and spent, about personal biography - as well as vicious smears that are cloaked in the wink of innuendo - these reduce the great issues of a great republic to a board game. The loser will not be one or another candidate. We shall all lose, because we will have allowed ourselves to be distracted from matters of substance. We deserve better, but we will have it only by taking on the civic responsibility of insisting upon better. The long-term health of our political system depends upon the engagement of the young - upon your engagement. Your freedom to do as you wish with your life entails a cost: a responsibility to advance and enhance the life of the republic. Our history is full of the evidence of those who have paid the greatest price for you to have this gift. Talk to one another about the issues of the present political campaign. I suspect you will do a better job of wrestling with the profound issues of our time than the campaigns of any of the candidates now standing before us promise to do. Debate the ideas, not the personalities. The candidates will want to persuade you to accept their vision of the future - but remember this is your future they are discussing. How do we engage in rigorous discussion of real issues in an atmosphere of respect and civility? How do we debate and disagree and challenge and still make this a community that is welcoming to all? This is the fundamental tension of American life - dating back to our defining documents, a Declaration of Independence, which affirmed life, liberty, and the pursuit of happiness, and a Constitution that shaped a government with power to direct and restrain. The first amendments of that Constitution provided protections for the individual from the government, and throughout our history citizens and the courts have sought to relate these powers and protections to the complicated interactions of a heterogeneous, vibrant, and sometimes contentious society. We have not always lived up to the promises of our founding. Liberty and equality, freedom and order, these abstractions that we applaud are marked by inherent tensions, mutual contradictions even, that we juggle constantly. This brings us full circle. It writes large our own task. At Dartmouth no code or regulation restrains the right to the free expression of ideas. If it did we would lose something critical to our intellectual purpose and to our core values. But as a place of learning the College too has a right - indeed, a responsibility - to champion those ideals that shape us. We stand for certain fundamental things: the rigorous pursuit of knowledge and an openness to new ideas, academic freedom and a spirit of inquiry, integrity and honesty, individuality and inclusiveness. We are sustained by vigorous discourse, as well as by respect and civility. Now, your right to challenge these values, or any others, is clear. But as president I assume the obligation to define and defend them and to protect here a learning community that welcomes us all - a community where, regardless of our race or gender or sexual orientation, we are all respected and valued and one in which different political and religious views are encouraged. Some critics suggest that the academy is marked by a particular orthodoxy, a "political correctness," although these same critics are frequently the most certain, even absolute, about truths - about what we should learn and about how we should know. If sometimes we seem more certain than we have a right to be, we also understand that the world is marked by change, and the tensions that often and necessarily follow change are seldom so simple as to be resolved by slogans. We recognize well the elusiveness of the truth that we consistently seek. Standing for something while resisting the comfort of orthodoxy is complicated, but it is a necessary part of our work. As we welcome you into this academic community, I enjoin you to embrace both the free expression of ideas and the principle of community. It won't always be easy to balance them, but the struggle to do so is a fundamental part of a Dartmouth education. At Convocation in the fall of 1950, President John Sloan Dickey challenged David T. McLaughlin and his fellow members of the Class of 1954 to remember that they were the "stuff" of this College - and what they were, Dartmouth would be. 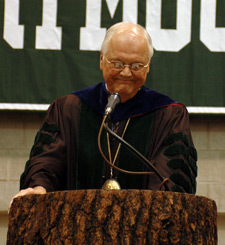 David McLaughlin surely spent the next 54 years making his College the better. While an undergraduate student, he was a star football player, president of the Junior class, a member of Phi Beta Kappa, and the head of the undergraduate student government. His was a long career of accomplishments; he assumed responsibility. As a student he joined President Dickey, the faculty, and other students in insisting that Dartmouth become a more open place. As a trustee he had the privilege of voting on behalf of the motion to make Dartmouth coeducational. He always insisted that our purpose was to enhance Dartmouth for students not yet admitted-or not yet born. Now, the baton is in your hands. You are not consumers of an education here; you are colleagues in an institution committed to learning, and you are the beneficiaries of a legacy passed along by generations of Dartmouth graduates. Your obligation to them is to leave the College stronger still for those who will follow. Members of the Class of 2008, today you have become a part of Dartmouth, and Dartmouth forevermore will be a part of you. You will never be the same. But you should know that by your very presence here Dartmouth itself will be changed, too. Take on this responsibility with confidence and joy. But also embrace with me a profound sense of gratitude for the privilege we share as members of this special community of learning. We have work to do - you and I - and it is time to begin! Welcome to Dartmouth.